First use of lunar rover on moon. Beautiful images of crew prospecting at edge of Hadley Rill. One of the three main parachutes failed, causing a hard but survivable splashdown. AKA: Endeavour/Falcon. Launched: 1971-07-26. Returned: 1971-08-07. Number crew: 3 . Duration: 12.30 days. Location: U.S. Air Force Museum, Dayton, OH..
CM and SM separation, parachute deployment, and other reentry events went as planned, but one of the three main parachutes failed, causing a hard but safe landing. Splashdown - at 4:47 p.m. EDT August 7, after 12 days 7 hours 12 minutes from launch - was 530 kilometers north of Hawaii and 10 kilometers from the recovery ship U.S.S. Okinawa . The astronauts were carried to the ship by helicopter, and the CM was retrieved and placed on board. All primary mission objectives had been achieved. Thunderstorms visited launch complex 39A during the month preceding Apollo 15's launch. Four lightning strikes damaged some ground support equipment but the spacecraft and launch vehicle were undamaged. Otherwise the countdown for Apollo 15 was, as launch director Walter Kapryan described it, "the most nominal countdown that we have ever had." At 9:34 a.m. on July 26, just 187 milliseconds behind schedule, the Saturn V carrying command module Endeavour and its crew blasted off. Twelve minutes later Scott, Irwin, and Worden were in orbit some 92 nautical miles above the earth, and after two revolutions their S-IVB stage reignited to send them on their way to the plain at Hadley. After extracting the lunar module Falcon (named for the Air Force Academy's mascot by the all-Air-Force crew) from its stowage atop the S-IVB, they settled down for an uneventful 3-day trip to the moon. Only two small midcourse corrections were required along the way. Four hours before settling into lunar orbit, the crew jettisoned the cover of the scientific instrument module in preparation for the lunar-orbital science to be conducted later. Endeavour went smoothly into lunar orbit. Scott and Irwin entered Falcon about 40 minutes early, checked out its systems, and had ample time to eat lunch before beginning powered descent. After they undocked, Worden put Endeavour into a circular orbit suitable for gathering scientific data. Ten hours into their fourth day, Scott powered up Falcon for the approach to Hadley. As had been the case throughout the mission so far, everything went well during the landing approach. At about 9,000 feet (2,750 meters) above the surface Scott noted the peak of Hadley Delta to his left; until he reached 5,000 feet (1,500 meters) the only other landmark he could spot was Hadley Rille. The terrain was less sharply defined than he had expected from simulations. After entering several redesignations of the landing site into his control computer, Scott brought Falcon down through blinding dust and touched down at 6:16 p.m. Eastern Daylight Time on July 29. Not sure of his exact location, Scott was sure he was well within the boundaries of his designated landing zone. The lunar module came to rest tilted back and to its left; two of its landing pads were just over the edge of a small crater that Scott had not been able to see as he approached the surface. During the next 67 hours Scott and Irwin were to ride and walk over more of the lunar surface than any of their predecessors. The first chore was a "standup EVA," to survey the landing area for the benefit of the scientists in Houston. Scott removed the upper hatch of the lunar module and stood on the engine cover, describing what he could see and taking photographs that would allow construction of a panorama of the landing area. One remarkable photograph showed clear evidence of stratigraphy in a prominent landmark ("Silver Spur") to the east of Hadley Delta - a feature the explorers were unable to see later because of unfavorable lighting. While Scott and Irwin carried out their assignments on the surface, Al Worden, orbiting above in Endeavour , had activated the scientific instruments and cameras and was busy gathering data. On his 15th revolution he spotted Falcon on the surface and relayed its position to Houston. The next morning Scott and Irwin were up early and out on the surface. They unloaded their roving vehicle without difficulty, climbed on and buckled their seat belts, and set out on the first traverse. Scott soon discovered that the rover's front wheels could not be steered. He could not correct the anomaly, but went ahead, relying on the rear-wheel steering alone. Their first goal was "Station 1," a spot on the rim of a medium-sized crater ("Elbow") located on the edge of Hadley Rille at the point where it makes a sharp bend. On the way Scott had to get the feel of driving the rover, which he found to be an excellent vehicle. Driving it on the moon, however, was not quite like driving the 1-g trainer, and among other things he had to keep his eyes on the surface ahead, especially when heading toward the sun, because surface features were not always readily visible. The rover's maneuverability was good, but at 8 to 10 kilometers per hour (5 to 6 miles per hour) the ride was a bit bouncy. Driving took all of Scott's attention, so Irwin provided most of the descriptions for Houston's scientists. Proceeding along the edge of Hadley Rille, the explorers had an excellent view of the entire width of the canyon (about 1.5 kilometers or almost 1 mile) and down its length to the sharp bend by "Elbow" crater. Landmarks along the route were not always easy to identify, but their course was laid out by range and bearing and they were never as uncertain about their position as Shepard and Mitchell had been on Apollo 14. Less than half an hour after leaving the LM, and having traveled something over 3 kilometers (about 2 miles) they reached their first stop, dismounted, and turned on the television camera to give Houston a view of the area. Using a telephoto lens, Scott photographed the far side of Hadley Rille where layering was obvious in outcrops not far below the rim. Panoramic photography and sample collection completed their work at Site 1. Remounting their vehicle, Irwin and Scott drove around "Elbow" crater to Site 2, about 500 meters (1,600 feet) farther down at a point where ejecta from St. George crater encroached on the edge of the rille. Here they began to encounter large blocks lying on the surface. One that excited Irwin particularly was a meter or so (3 to 4 feet) across, its downslope edge buried in the loose soil and its upslope edge free of the surface. He photographed and sampled it; then once again they took panoramic photographs and soil samples and drove a double core tube into the edge of a crater. With no more stops scheduled, Scott now turned the rover on to the heading prescribed by his navigation system to return to the LM. On the way he cautiously tried some maneuvers with the rover. Attempting a turn on a downslope, he discovered that "you can't go fast downhill in this thing, because if you try and turn with the front wheels locked up like that, they dig in and the rear end breaks away, and around you go; and we just did a 180 [degree turn]." Near Elbow crater Scott noted that there was a "neat place to go down into the rille," but Capcom reminded him that "we'd rather that you don't take that option." Riding back toward Falcon , Scott and Irwin frequently saw features they would have liked to stop and examine, but they had no time, so they briefly described them to Houston and continued. When they first caught sight of the LM they estimated its bearing from the rover at 15 degrees, but the navigation system showed 34, indicating some drift in the system. They reached the lunar module 2 hours and 15 minutes after they had left, parked the rover, and unloaded the surface experiments package. Scott had picked a spot about 110 meters (360 feet) west-northwest of the Falcon to deploy the instruments. Apollo 15's experiments package included a new heat flow experiment, which required drilling two holes in which temperature sensors would be placed. The experiments were deployed without difficulty, but the second heat-flow drill hole caused problems when the drill stuck and proved difficult to remove. By this time the astronauts were approaching the limit of their life-support systems, so Mission Control directed Scott to leave the drill in the hole and get on to other tasks. After deploying the laser reflector and the solar-wind collector he and Irwin returned to Falcon and closed the hatch. They had been out for six and a half hours and covered 10.3 kilometers (5.6 miles) on the lunar surface - more than twice as far as the Apollo 14 astronauts had traversed (on foot) during their entire mission. A 40-minute debriefing with Houston completed their first day of lunar exploration. In the press briefing immediately following the first day's surface activity, flight director Gerald Griffin expressed satisfaction with the astronauts' performance. Apart from the failure of the rover's front-wheel steering, which had not significantly impaired the planned activity, everything had gone well. Scott had shown a somewhat higher metabolic rate than anticipated, resulting in faster consumption of oxygen than had been allowed for. This was not a serious concern, but it would have to be taken into account in planning the remaining excursions. About the only changes anticipated for the next day's activity were to attempt to solve the rover's steering problem and to try to extract the drill core for the heat-flow experiment. However, the science planning team still had to review the day's results; plans for the second traverse could well be changed in light of what had been accomplished. "We're going to depend very much on the observations from the two of you, and it's going to be . . . your choice on exactly where you'd like to range and where you'd like to carry out your major sampling tasks.... We're looking now, primarily, for a wide variety of rock samples from the [Apennine] Front. You've seen the breccias already. We think there may very well be some large crystal[line] igneous [rocks], and we'd like samples of those and whatever variety of rocks which you're able to find for us - but primarily, a large number of documented samples and fragment samples. . . . I'll [stop] now and ask for any more questions. " Scott replied, "No, no questions, Joe. You're really talking our language today." During their extensive geological training, Scott had come to enjoy field geology and considered himself a serious amateur, and this was the kind of freedom he wanted. 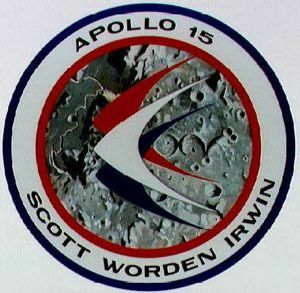 It was the kind of exploration the geologists had wanted as well, and although they would have preferred to have one of their own on the moon, apparently they were confident enough of Scott's and Irwin's training to give them a much freer hand than any previous team of lunar explorers. Irwin: "I think we just found what we came for. " Scott: "Look at the plage [plagioclase] in there. . . . I think we might [have found] ourselves something close to anorthosite, because it's crystalline, and . . . it's just almost all plage. What a beaut! " Irwin: "That really is a beauty. And . . . there's another one down there. " "What we came for" was a specimen of the primitive lunar crust - anorthosite, the rock that some scientists believed was the first material that solidified from the molten outer layer of the moon. The possibility of finding this material was one reason the Hadley-Apennines site had been chosen; scientists thought that if anorthosite was to be found on the moon, a highland site (and one adjacent to a large collisional mare) would be the best place to look for it. Scott put the sample into a bag by itself; back on earth it was dubbed the "Genesis rock." After a few more minutes of sampling and photographing the site, they climbed back on the rover and started back to the lunar module. Since there was time available, Houston directed them to stop at site 4 (the one that had been deleted before the traverse started) where they took more samples. Then it was back to Falcon to unload their cargo and return to the surface experiments site. Scott made another attempt to remove the core drill he had left in the ground the day before, but succeeded only when Irwin helped him pull it out. The second hole for the heat-flow experiment was drilled and the temperature sensors were emplaced in both holes. 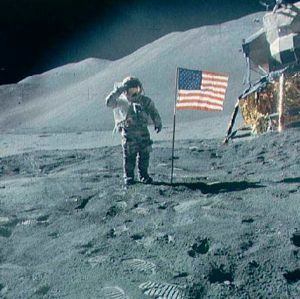 After performing a few more experiments in soil mechanics, Scott and Irwin drove back to the lunar module, where they had one more task to perform: planting the American flag at the landing site. That done, they transferred the samples to the LM, and closed the hatch, having completed the most productive lunar science traverse of the program so far. "I'm told that we checked off the 100 percent science completion square some time during EVA-1 or maybe even shortly into EVA-2. From here on out, it's gravy all the way, and we're just going to play it cool, take it easy, and see some interesting geology. It should be a most enjoyable day. " "Okay, Joe," Scott replied, "Thank you. We're looking forward to it." Their work was not the mission's only contribution to lunar science. While they had been dashing around the surface, Al Worden in Endeavour had been circling the moon operating the cameras and instruments. In Endeavour's highly inclined orbit he was able to see features that no previous observers had laid eyes on, and he provided detailed descriptions each time he crossed the earth-facing side of the moon. 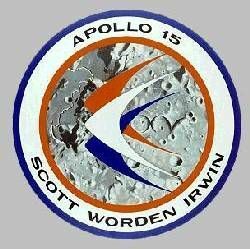 Early the next morning Irwin and Scott left the lunar module on a west-northwesterly heading to get a good look at Hadley Rille. After describing, photographing, and televising the features of the broad canyon, including evident layering in the walls, they completed their third traverse in just under 5 hours. ". . . In my left hand, I have a feather. In my right hand, a hammer. . . . One of the reasons we got here today was because of a gentleman named Galileo a long time ago who made a rather significant discovery about falling objects in gravity fields. . . . The feather happens to be, appropriately, a falcon feather, for our Falcon, and I'll drop the two of them here and hopefully they'll hit the ground at the same time. [They did.] . . . This proves that Mr. Galileo was correct in his findings. " Scott then drove the rover about 300 feet (90 meters) away, where he parked it with the television camera pointed at Falcon , aligned the antenna with earth, and walked back to help Irwin load sample bags into the lunar module. For the next three hours the crew of the Falcon were occupied with stowing equipment and sample containers and configuring the LM for takeoff. Then, while the television camera watched, Falcon's ascent stage shot up from the surface in a shower of fragments of insulation, visible for only a second or two. Flight controllers had intended to follow Falcon with the camera, but decided against it when problems developed in the camera's control system. The result contrasted sharply with the majestic rise of a Saturn V; with a "quick pop" and "a shower of sparks [that] looked more like something left over from the Fourth of July," as one columnist put it, Falcon quickly disappeared from the TV screen. Falcon and Endeavour linked up an hour and 34 minutes later, and after jettisoning the lunar module the three astronauts settled in for two days of additional lunar-orbital data-gathering. On their last orbit they released the scientific subsatellite, then headed for home. While the spacecraft was still nearly 200,000 miles (320,000 kilometers) from earth, Al Worden carried out the last extravehicular excursion of the mission, a 38-minute "space walk" to remove film cassettes from the cameras in the scientific instrument module. The long voyage home ended on August 7, when Endeavour dropped into the Pacific Ocean about 320 miles (515 kilometers) north of Hawaii. The landing was a little harder than normal because one of the three parachutes failed to open fully, but no damage or injury resulted. Family: Manned spaceflight. People: Irwin, Scott, Worden. Country: USA. Spacecraft: Apollo CSM. Projects: Apollo. Launch Sites: Cape Canaveral. Agency: NASA Houston. 1970 January 29 - . Ground rules for Apollo service module design and integration established - . Nation: USA. Program: Apollo. Flight: Apollo 15, Apollo 16, Apollo 18, Apollo 19. Spacecraft: Apollo CSM, CSM Block II. Ground rules for service module design and integration, established during recent changes in the lunar orbital science program, were reported. The Apollo LM experiment hardware would be installed and tested at KSC. A single scientific instrument module configuration was being proposed for Apollo 16-19 with modification kits developed, as required, to install Apollo 18 and Apollo 19 experiments. An expanded Apollo LM data system would be available for Apollo 16 (spacecraft 112). 1971 March 10 - . Photographic coverage of a lunar eclipse during the Apollo 15 mission studied - . Nation: USA. Program: Apollo. Flight: Apollo 15. Spacecraft: Apollo CSM. Action was initiated to determine the feasibility of providing photographic coverage of a lunar eclipse from the lunar surface or the CSM during the Apollo 15 mission. The eclipse would occur on August 6, three or four days after the scheduled Apollo 15 mission lunar surface liftoff. 1971 April 26 - . Quarantine for crew members who would go to the moon on future Apollo flights was discontinued - . Nation: USA. Related Persons: Low, George. Program: Apollo. Flight: Apollo 15. Acting NASA Administrator George M. Low discontinued the quarantine for future Apollo flights to the moon beginning with the Apollo 15 mission. The decision was based on a recommendation of the Interagency Committee on Back Contamination (ICBC). The ICBC would continue as an active body, however, at least until the results of the last Apollo lunar mission were reviewed. Biomedical characterization of returned lunar samples would also be continued. 1971 May 13 - . Contamination measurements on the remaining Apollo flights for use in Skylab planning - . Nation: USA. Program: Apollo. Flight: Apollo 15, Apollo 16. NASA was considering a plan for obtaining contamination measurements on the remaining Apollo flights for use in Skylab planning. The plan required photography on Apollo 15 of liquid dumps, limited magnitude starfield, and window deposition photography. Apollo 16 and 17 would carry instrumentation to measure cloud intensity and effects, deposits and their effects, critical surfaces, particle count, surface charge potential, and pressure. Apollo 15 LM - . Call Sign: Falcon. Payload: Apollo LM 10. Mass: 16,437 kg (36,237 lb). Nation: USA. Agency: NASA Houston. Program: Apollo. Class: Moon. Type: Manned lunar spacecraft. Flight: Apollo 15. Spacecraft: Apollo LM. Duration: 12.30 days. Decay Date: 1971-08-07 . USAF Sat Cat: 5351 . COSPAR: 1971-063x. Apogee: 169 km (105 mi). Perigee: 166 km (103 mi). Inclination: 29.68 deg. Period: 87.84 min. Apollo 15 Subsatellite - . Payload: PFS 1. Mass: 36 kg (79 lb). Nation: USA. Agency: NASA Houston. Program: Apollo. Class: Moon. Type: Lunar probe. Flight: Apollo 15. Spacecraft: PFS. USAF Sat Cat: 5377 . COSPAR: 1971-063D. Released from Apollo 15 into 102 x 142 km lunar orbit on 4 August 1971 at 20:13:29 GMT; studied lunar particles and included fields experiments. Last telemetry from lunar orbit in 1984..
1971 July 30 - . 11:16 GMT - . Apollo 15 lands near Hadley Rille - . Nation: USA. Flight: Apollo 15. Apollo 15 entered lunar orbit at 4:06 p.m. EDT July 29. 1971 July 31 - . 00:16 GMT - . EVA Apollo 15-1 - . Crew: Scott. EVA Duration: 0.0229 days. Nation: USA. Related Persons: Scott. Program: Apollo. Class: Moon. Type: Manned lunar lander. Flight: Apollo 15. Spacecraft: Apollo LM. Stand-Up External Vehicular Activity. Photographed lunar surface panorama from top hatch of LM..
1971 July 31 - . 13:12 GMT - . EVA Apollo 15-2 - . Crew: Irwin, Scott. EVA Duration: 0.27 days. Nation: USA. Related Persons: Irwin, Scott. Program: Apollo. Class: Moon. Type: Manned lunar lander. Flight: Apollo 15. Spacecraft: Apollo LM. Explored lunar surface near LM and deployed ALSEP unmanned scientific station equipment..
1971 August 2 - . Apollo 15 - Wakeup Song: Tijuana Taxi - . Flight: Apollo 15. "Tijuana Taxi" by Tijuana Brass. Apollo 15 departs lunar surface - . Nation: USA. Flight: Apollo 15. EVA Apollo 15-5 - . Crew: Irwin, Scott. EVA Duration: 0.0014 days. Nation: USA. Related Persons: Irwin, Scott. Program: Apollo. Class: Moon. Type: Manned lunar lander. Flight: Apollo 15. Spacecraft: Apollo LM. Internal Vehicular Activity. Threw excess equipment out of LM before lift-off..
1971 August 4 - . Apollo 15 - Wakeup Song: Theme From 2001: A Space Odyssey - . Flight: Apollo 15. "Theme From 2001: A Space Odyssey" Spacecraft communicator Karl Henize. 1971 August 5 - . 15:31 GMT - . EVA Apollo 15-6 - . Crew: Irwin, Worden. EVA Duration: 0.0264 days. Nation: USA. Related Persons: Irwin, Worden. Program: Apollo. Class: Moon. Type: Manned lunar spacecraft. Flight: Apollo 15. Spacecraft: Apollo CSM. Stand-Up External Vehicular Activity. Deep space retrieval of film cartridges from Service Module..
1971 August 6 - . Apollo 15 - Wakeup Song: Anchors Aweigh - . Flight: Apollo 15. "Anchors Aweigh" For Jim Irwin..
1971 August 7 - . Apollo 15 - Wakeup Song: Hawaiian War Chant - . Flight: Apollo 15. "Hawaiian War Chant" from record"Hawaii Calls". - Al Kealoha Perry. Landing of Apollo 15 - . Return Crew: Irwin, Scott, Worden. Nation: USA. Related Persons: Irwin, Scott, Worden. Program: Apollo. Flight: Apollo 15. CM and SM separation, parachute deployment, and other reentry events went as planned, but one of the three main parachutes failed, causing a hard but safe landing. Splashdown - at 4:45 p.m. EDT (20:45 GMT), after 12 days 7 hours 12 minutes from launch - was 530 kilometers north of Hawaii and 10 kilometers from the recovery ship U.S.S. Okinawa . The astronauts were carried to the ship by helicopter, and the CM was retrieved and placed on board. All primary mission objectives had been achieved. Splashdown of Apollo 15 - . Nation: USA. Flight: Apollo 15. Apollo 15 landed at 20:45 GMT. CM and SM separation, parachute deployment, and other reentry events went as planned, but one of the three main parachutes failed, causing a hard but safe landing. Splashdown - at 20:47 GMT, 12 days 7 hours 12 minutes from launch - was 530 kilometers north of Hawaii and 10 kilometers from the recovery ship U.S.S. Okinawa . The astronauts were carried to the ship by helicopter, and the CM was retrieved and placed on board. 1971 October 6-7 - . 1972 May 7 - .